Seven-year-old Olivia was jumping on the bed when her mom asked her to stop. She kept jumping, so her dad yelled at her. 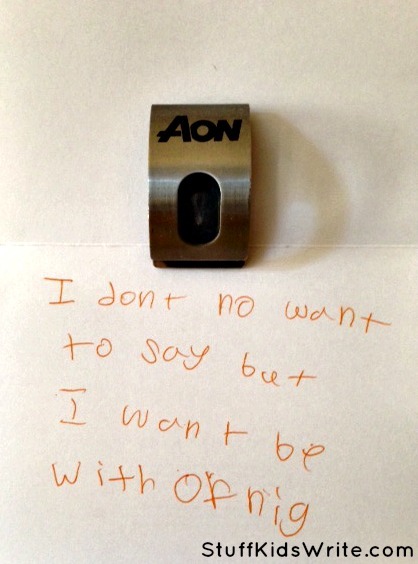 Olivia responded in writing, handed this note to her parents, and ran to another room. Do you think an adult ofnig is a pub? I hope so. Thanks to Thuy for sharing what Olivia wrote. You should share, too. Submit an image of a child’s funny writing to either mcfadden.chase@gmail.com or leanneshirtliffe@gmail.com. Posted on February 12, 2013, in Notes. Bookmark the permalink. 5 Comments. Reblogged this on TESOL Global Network.